On the two-year anniversary of the earthquake in Haiti, the Schuster Institute for Investigative Journalism is launching this resource page—inspired by Haiti Grassroots Watch’s investigative journalism project. This page is designed for the use of reporters and editors, photojournalists, and producers who want to take on the important work of holding accountable the governments, agencies, NGOs, donor organizations, contractors, and individuals who have failed to fulfill their promises in Haiti. E. Benjamin Skinner, guest blog on The American Interest for Walter Russell Mead, a Henry A. Kissinger Senior Fellow for U.S. Foreign Policy at the Council on Foreign Relations, Feb. 23, 2010. The New York Times "Room for Debate": "Haiti's Children and the Adoption Question," with commentary by E.J. Graff and other prominent experts in the field, Feb. 1, 2010. PRI's The World, an interview with Senior Fellow E. Benjamin Skinner on the subject of "Haiti's Child Slaves," Feb. 1, 2010. "ABC News, Time document E. Benjamin Skinner's Haiti's rescue mission," Jan. 21, 2010, BrandeisNow. This nonprofit online news organization keeps the watchful eyes of reporters focused on what’s not working as it should in Haiti’s reconstruction. Thursday, January 12, is the second anniversary of Haiti’s catastrophic earthquake. More than 200,000 people are estimated to have died when 7.0 magnitude tremors rippled across the island at nearly five o’clock that afternoon. With its epicenter just 16 miles west of Port-au-Prince, Haiti’s capital, hundreds of thousands of residents, many living in dire poverty already, were left without homes or jobs or access to water, food, medical care and schools. At first, international attention was riveted on Haiti as emergency forces arrived. Within weeks, however, most of the foreign press departed as the tough, long-term work of reconstruction got underway. Complicated by the nation’s chaotic political situation and fractured infrastructure, observers point out that the rebuilding has taken place largely without accountability. “Haiti: Seven Places Where the Earthquake Money Did and Did Not Go,” published in early January, addresses some of these challenges. A consistent few—including Haiti Grassroots Watch (HGW), or Ayiti Kale Je, meaning “Haiti Eyes Peeled” in Creole—have drawn attention to the slow pace of reconstruction, or lack thereof, as aid has been held up or wasted, and as various actors have bickered while hundreds of thousands of refugees remain in squalid camps. HGW’s reporters have investigated, published and broadcast stories spotlighting numerous cases of inefficiency and corruption, which many experts accurately predicted would accompany this massive recovery effort. HGW is a nonprofit online news partnership in which journalists work with community radio reporters and student reporters to pursue stories throughout Haiti. For reasons rooted in the country’s history of violent and repressive regimes as well factors such as a lack of resources and open records laws, accountability reporting is a rare commodity in Haiti. This is why soon after the earthquake struck veteran journalist, documentary filmmaker, and scholar Jane Regan co-founded HGW. She went on to initiate the country’s first university-level investigative journalism class, launch a series of workshops to teach and train Haitians, and—with Knight International Journalism Fellow Kathie Klarreich—help launch the Fund for Investigative Journalism in Haiti which offers support for reporters who need financial help in completing their projects. During the two decades that Jane Regan has reported from Haiti, she observed the paucity of investigative journalism. Understanding what would be necessary to spur and support watchdog reporting in this troubled nation, she worked with AlterPresse and the Society for the Animation of Social Communication to assemble a small, dedicated part-time and volunteer staff. She directs and participates in these investigative journalism training and watchdog reporting efforts. 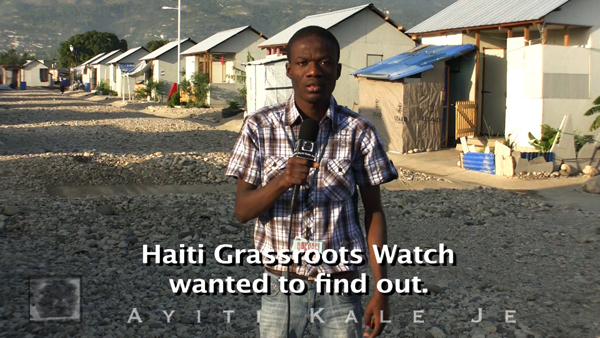 Haiti Grassroots Watch’s stories are published in French and English (with some in Spanish) and are picked up by Haitian and foreign news sites and newspapers. The audio versions in Haitian Creole are broadcast by commercial and community radio, and most reports are accompanied by a video documentary that television stations will sometimes broadcast and are also embedded in HGW articles and on other websites. “Behind the closed doors of Port-au-Prince ‘reconstruction,’” an investigation into what is blocking the reconstruction of downtown and why the Champ de Mars is still home to thousands of families, published on June 9, 2011. “Haiti’s 1.3 Million Camp Dwellers Waiting in Vain,” sent out on October 15, 2010 by Inter Press Service (IPS) to news organizations in 138 countries. “Seeding Reconstruction or Destruction?” An investigation into the distribution of Monsanto and other seeds post-January 12, published on March 30, 2011. “Monsanto in Haiti,” HGW, May 5, 2011, truthout.org. “Haitians Challenge Monsanto’s Influence,” based on reporting from HGW, Beverly Bell, June 30, 2011, truthout.org. “Cash for… What?” An investigation of whether cash-for-work programs help “the recovery,” September 11, 2010. “’Cash-for-Work’ Seen as Double-Edged Sword,” November 10, 2010 IPS. “Open for Business—Part 1,” HGW, December 20, 2011, IPS. "Haiti's 1%," Arnaud Robert and Paolo Woods, January 13, 2012, Foreign Policy. "Where did the money go in Haiti?" Boston's 100,000 Haitians are frustrated with the slow pace of reconstruction. 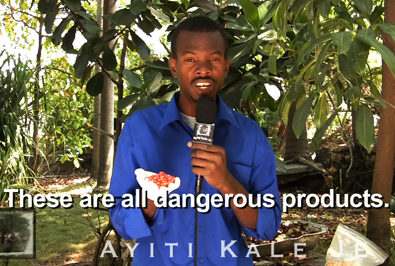 WGBH's Phillip Martin talks to Jane Regan of Haiti Grassroots Watch and others to find out. January 12, 2012. PRI's The World understands Haiti through comics. January 12, 2012. Cartoon Movement has also developed a cartoon series illustrating their perspective. "Haiti: Two years after the earthquake, where did the money go?," Donovan Webster, January 10, 2012, Global Post. "Is Bill Clinton Haiti's Hope for Salvation?" Marc Hujer, January 10, 2012, Spiegal Online International. “Haitians Move from Praise to Resentment of Aid Organizations,” Center for Public Integrity, iwatch news, January 10, 2012. Haiti's Slow Recovery, January 8, 2012, The New York Times editorial. Haiti Can Be Rich Again, Laurent Dubois and Deborah Jenson, January 8, 2012, The New York Times op-ed. Haiti: Is Humanitarian Aid Going Where it’s Needed? October 8, 2011, PRI's The World. PRI's The World Anchor Marco Werman speaks with Dutch journalist Linda Polman, author of “The Crisis Caravan: What’s Wrong with Humanitarian Aid?” Polman says Haiti is an example of a place where a lack of coordination has hampered aid distribution. The Truth About NGOs, Haiti, Allan Little, BBC World Service documentary. "Haitian Democracy Depends on Scrutiny of Aid Watchdog," Anastasia Moloney, December 20, 2011, AlertNet. “Samia Salomon: A Central Pillar of Haiti's Community Journalism Network,” Georgianne Nienaber, February 28, 2011, OpEdNews.com. "Haiti's Aftershocks," Jane Regan, Summer 2011, The IRE Journal. 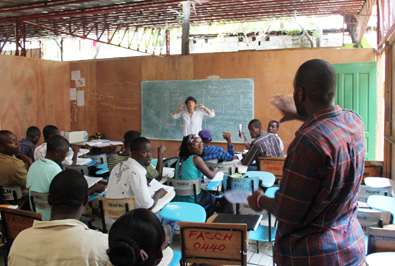 “Haiti News Start-Up Challenges Conventional Reconstruction Wisdom,” Megan Tady, November 25, 2010, In These Times. "Disaster Relief 2.0: The Future of Information Sharing in Humanitarian Emergencies," 2012, United Nations Foundation and Vodafone Foundation. "Real Time Charitable Giving," 2012, Pew Internet, Pew Research Center, and the Berkman Center for Internet and Society at Harvard University. Copyright © 2012 Schuster Institute for Investigative Journalism at Brandeis University, Waltham, MA. All rights reserved.